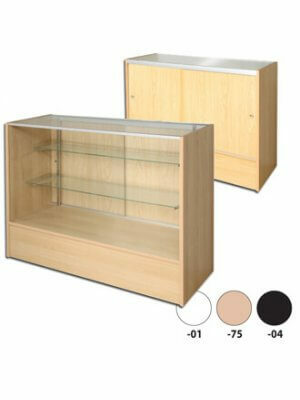 Slimline counters are a popular shop counter that comes with a range of modules. The Slimline counters have a compact design, which saves floor space in your shop. You can create an unique shop counter from the many different modules to fit your needs. Slimline counters are made from 18 mm. thick laminated chipboard with plastic edging. The modules are available with 3 different colors; Maple, White or Black. The Slimline are delivered flat-packed for easy self-assembly.